Very deep Chandra observation of the Tycho supernova remnant. 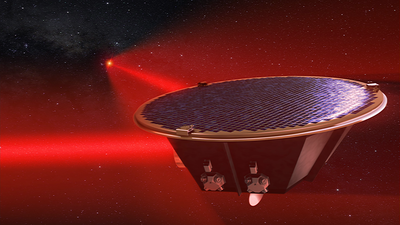 Image credit: NASA/CXC/Rutgers/K.Eriksen et al. 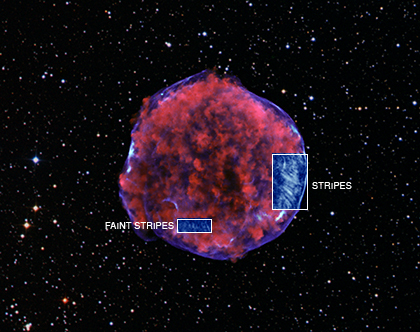 A long Chandra observation of Tycho has revealed a pattern of X-ray "stripes" never seen before in a supernova remnant. Artist’s impression shows the pair of brown dwarfs named CFBDSIR 1458+10. NASA put the squeeze on a large rocket test section today. Results from this structural strength test at NASA's Marshall Space Flight Center in Huntsville, Ala., will help future heavy-lift launch vehicles weigh less and reduce development costs. 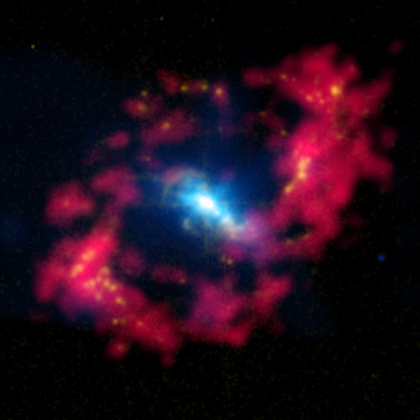 X-ray observations made by the Suzaku observatory provide the clearest picture to date of the size, mass and chemical content of a nearby cluster of galaxies. The study also provides the first direct evidence that million-degree gas clouds are tightly gathered in the cluster's outskirts. 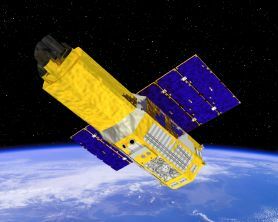 Suzaku is sponsored by the Japan Aerospace Exploration Agency (JAXA) with contributions from NASA and participation by the international scientific community. 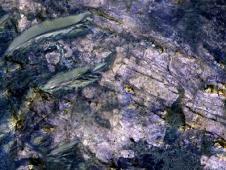 The findings will appear in the March 25 issue of the journal Science. 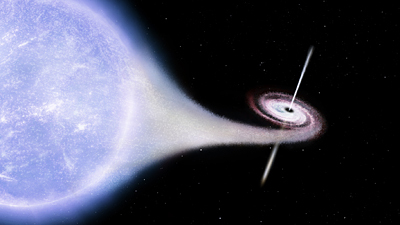 Artist's impression of the Cygnus X-1 black hole system. Credits: ESA. Recent research aboard the space shuttle is giving scientists a better understanding of how infectious disease occurs in space and could someday improve astronaut health and provide novel treatments for people on Earth. 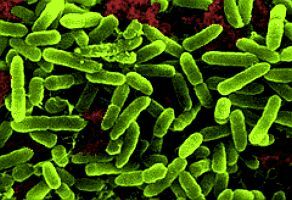 category: Astrobiology, NASA Comments Off on Recent research aboard the space shuttle is giving scientists a better understanding of how infectious disease occurs in space and could someday improve astronaut health and provide novel treatments for people on Earth. 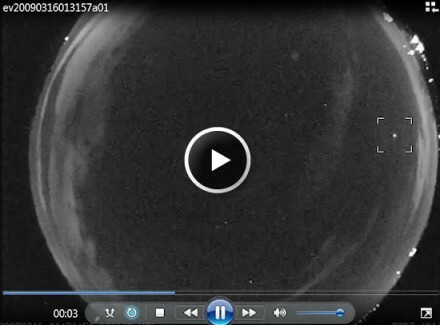 On March 17th, MESSENGER Mission Operations Center at the Johns Hopkins University Applied Physics Laboratory (APL) in Laurel, Md., received the anticipated radiometric signals confirming nominal burn shutdown and successful insertion of the MESSENGER probe into orbit around the planet Mercury. The spacecraft rotated back to the Earth and started transmitting data. Upon review of these data, the engineering and operations teams confirmed that the burn executed nominally with all subsystems reporting a clean burn and no logged errors. 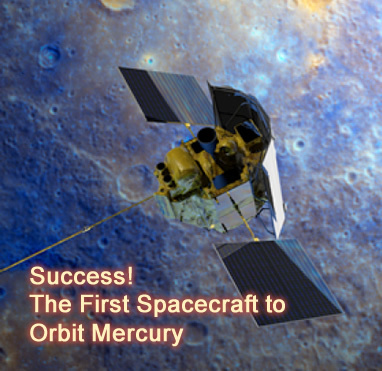 MESSENGER’s main thruster fired for approximately 15 minutes slowing the spacecraft by 1,929 miles per hour (862 meters per second) and easing it into the planned eccentric orbit about Mercury. The rendezvous took place about 96 million miles (155 million kilometers) from Earth. The 5th International Olympiad on Astronomy and Astrophysics will be held in Poland from 25th August to 3th September, 2011.
category: Astronomy Olympiads Comments Off on The 5th International Olympiad on Astronomy and Astrophysics will be held in Poland from 25th August to 3th September, 2011. The International Olympiad on Astronomy and Astrophysics, or IOAA, is an annual event in which high school students from around the world compete against each other, solving theoretical, analytical and observational problems in the fields of astronomy and astrophysics. Despite being relatively young compared to the other recognized International Science Olympiads (the first was held in 2007), the high standards of the Olympiad and the work it does to promote astronomy education, particularly in regions with emerging astronomy programmes, have gained the support of the President and Commission 46 of International Astronomical Union and of national governments of participating countries. The organisation and statues of the IOAA are based on those of the long-running International Physics Olympiad. Each IOAA is organised under the auspices of the Ministry of Education of the host country and lasts for ten days. Participating countries each send one team of up to five students (still attending or having just finished high school) and two adult team leaders, who approve the problems and translate them into the native languages of the students. Accomodation and participation costs during the ten days are covered by the organisers for the seven team members. Teams pay for travel to the host country, and for any extra persons ('observers') or accomodation beyond this period. Previous Olympiads were held in Thailand, Indonesia, Iran and China, and the 6th will be held in Brazil in 2012. Preliminary registration is open until March 31. If your country is not already represented and you wish send a team, please contact the Local Organising Committee as soon as possible. Further information on the 5th IOAA is available at http://www.ioaa2011.pl . Jupiter (left) and Mercury (right) photographed at sunset on March 13, 2011. Astronomers using NASA's Hubble Space Telescope have ruled out an alternate theory on the nature of dark energy after recalculating the expansion rate of the universe to unprecedented accuracy. 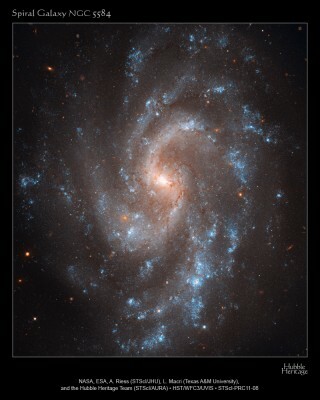 The universe appears to be expanding at an increasing rate. Some believe that is because the universe is filled with a dark energy that works in the opposite way of gravity. One alternative to that hypothesis is that an enormous bubble of relatively empty space eight billion light-years across surrounds our galactic neighborhood. If we lived near the center of this void, observations of galaxies being pushed away from each other at accelerating speeds would be an illusion. 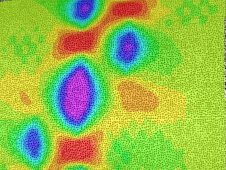 have been identified from spectrometer observations. Rocks on Mars dug from far underground by crater-blasting impacts are providing glimpses of one possible way Mars' atmosphere has become much less dense than it used to be. At several places where cratering has exposed material from depths of about 5 kilometers (3 miles) or more beneath the surface, observations by a mineral-mapping instrument on NASA's Mars Reconnaissance Orbiter indicate carbonate minerals. NGC 4151: An Active Black Hole in the "Eye of Sauron"
category: Chandra Space Telescope, Galaxies, NASA Comments Off on NGC 4151: An Active Black Hole in the "Eye of Sauron"
NASA will host a media teleconference to discuss the first spacecraft to orbit Mercury. 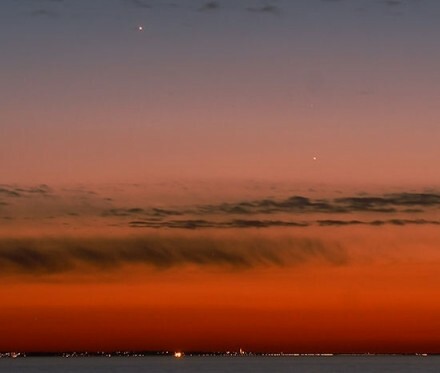 NASA's MErcury Surface, Space ENvironment, GEochemistry, and Ranging, or MESSENGER, will enter orbit at approximately 9 p.m. EDT on Thursday, March 17. The spacecraft has conducted more than a dozen laps through the inner solar system for nearly 7 years. 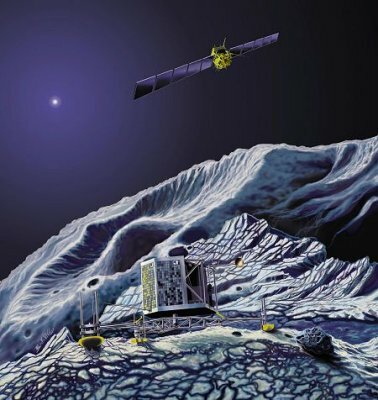 -- Andy Calloway, MESSENGER mission operations manager, Johns Hopkins University Applied Physics Laboratory (APL) in Laurel, Md. 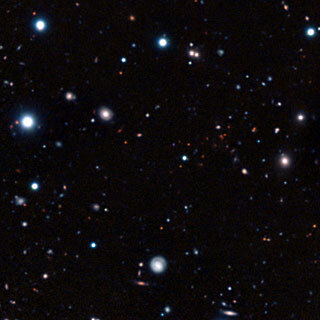 The most remote mature cluster of galaxies yet found. space, to track very slight spacetime distortion caused by gravitational waves. Comet 67P/Churyumov-Gerasimenko.Image credits: Astrium - E. Viktor.